Allie had feeding therapy today at the clinic and she ate pretty well. She ate 3/4th of a corn dog and 1 go-gurt. It wasn't enough calories for a full meal but it was calories consumed! Our regular therapist is back from vacation so her and I had a good talk today. Ms. Anna (Allie's feeding therapist) has been a feeding therapist for many years (actually Anna is ready to retire). In all of her years as being a therapist, she has never helped another child like Allie. 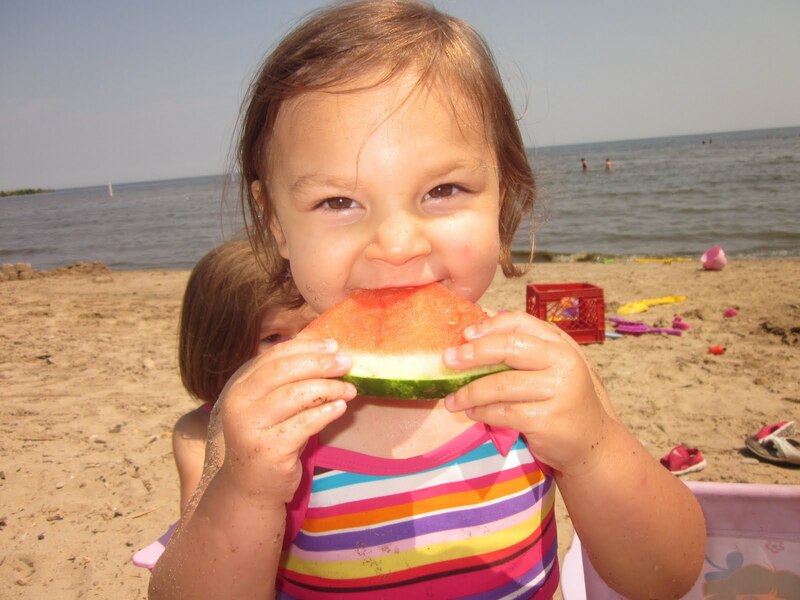 Most children with feeding issues have the inability to eat, oral aversions or other issues, but she has not encountered another child like Allie. Allie has every ability to eat (safely) but simply refuses food after a couple bites. Ms. Anna has been helping Allie for several months and she does not think that Allie's eating issues are behavioral. She has seen Allie willing and able to sit at the table and consume her meal. Ms. Anna feels that if a child has behavioral issues with eating, they will NEVER come to the able to eat and willingly eat. Allie will sit and eat at the table at therapy about 70% of the time. So, Ms. Anna said if it's behavioral, Allie wouldn't be complying so often at therapy. 30% of the time at therapy, Allie will take 2-3 bites and declare she's done eating. One Allie makes up her mind she's done eating, you can almost bet you won't get her to eat anymore. Allie has no oral aversions, she will try everything and anything. She can handle all textures of foods with the exception of very chewy meats. Since Allie's behavior and energy levels have not fluctuated with our tube weaning attempt, Ms. Ann is thinking the same as me - Allie doesn't feel the "hunger sensation". Ms. Anna seems to think that going 1 month without adequate food would have triggered Allie's hunger by now - however, nobody knows for sure of course. Ms. Anna is writing up a short progress report and sending it to Allie's doctors so they all fully understand where she is at with eating orally. She wants to make it clear to them that Allie's oral intake is sporadic, there is no rhyme or reason to it at all. Some days she eats a little bit and other days she eats next to nothing. Our weight check for this week was cancelled so it's been re-scheduled for next Wednesday. Allie's GI doctor wanted to give her new appetite enhancer medication time to kick in before our next weight check. So, after that weight check, I will be consulting with Dr. Brown and see what his thoughts are. I have now increased Allie's liquid intake with her tube. I'm getting nervous about dehydration since Allie is consuming less and less liquid. Yesterday when I was giving her a quick bolus feed with water, she was telling me she wanted food with it. Not sure if she was joking or just hoping we go back to tube feeds shortly. So, our roller coaster continues but I must say that Allie is doing amazing! She is still full of energy and continues to be her feisty self! She joined dance class a couple weeks ago and is loving it - I think she's a natural born dancer (with her own special moves). 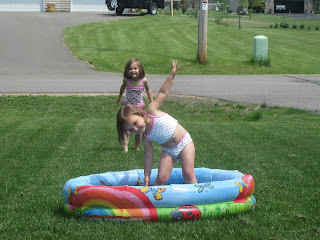 The girls are really enjoying their summer - they play with friends almost everyday. I'm enjoying the summer with the girls, however I'm extremely stressed. Feelings of not being able to get Allie a diagnosis is creeping up again. This tube wean has really taken a toll on me and watching Allie consume very few calories each day is still hard to digest. It's just extremely frustrating to watch your child refuse food day after day. But I have to keep looking at the big picture and in that picture, we are all doing wonderful! Day 34 - wow, it's been over 1 month since we started this wean. Part of me feels like we are slowly drowning but our rescue will be coming soon and another part of me feels like we are not drowning at all we are simply learning how to swim. I have done a lot of thinking lately about Allie not enjoying food and simply just being not interested in food. For 3 years, I have watched and studied her every move when it comes to eating orally. I have watched how she takes 2-3 bites and then simply announces she's done eating. I have watched her tell me she's hungry but then when we put food in front of her, she's not interested. I have watched her eat a whole hot dog at times with no problems at all. I have watched her drink the majority of her calories and the next week not drink anything. There is absolutely no rhyme or reason in regards to Allie's eating habits. But, the more I watch her and study her, I'm almost 100% convinced she doesn't feel the "hunger" sensation. When you or I feel "hungry" and we don't have access for food immediately, we feel different. We may get shaky, upset, irritable, tired, get a headache, etc. Then, when we satisfy our hunger, we feel back to normal again and we continue on our day. If we don't consume enough calories throughout the day, we feel tired and sluggish at the end of the day or throughout the day. One thing I have noticed about Allie this past month is that no matter how little calories she consumes each day, her energy level and behavior is consistent. Allie has not slowed down even 1 notch since consuming very few calories. She sleeps the same amount of time during the nigh and during nap time (actually her naps are now shorter) and her energy level while awake is still 100% full force ahead. Allie's behavior never changes when she does or doesn't eat. It seems as if food doesn't affect her at all. Kind of like she doesn't need food for energy. It's a very strange concept and if I wasn't witnessing all of this with my own eyes, I probably won't believe it. Since Allie's energy level and behavior does not change while consuming very few calories, I'm convinced she doesn't feel hungry. There is no way that a little child could feel hungry and not cry, wine or simply be upset about not satisfying the feeling. There is still the possibility that Allie feels "hungry" but doesn't understand the sensation, however my thought is her behavior or energy level would still change if she felt it even though she didn't know what it was. She would still feel different than normal and act out on the feeling. Of course I'm no doctor but I do know my little girl and the more I study her, I'm beginning to truly believe she doesn't feel the "hunger" sensation. Matt and I have been talking a lot about Allie's tube weaning progress and we both feel like it's going down hill. Allie is losing weight and consuming less food orally than before. Of course we don't want to give up just yet, because progress could be right around the corner. We both agreed we should try Allie on an appetite enhancer medication again. This seems like the optimal time to try it. So, I contacted her GI yesterday and he agreed. We started Allie on Erythromycin last night and we are hoping to see her appetite increase in the next couple days. Allie was on this medication a year and a half ago and we didn't see much progress, but we are hoping this time is different. Since Allie lost weight at her last weigh in, I made an appointment for tomorrow morning for another weight check. We'll see if the scale tips up or down - of course we are praying for up! On a very positive note, Allie had a great feeding therapy session today and she ate like a champ! YEAH ALLIE!!! Allie met with her ENT doctor this morning and it was a quick easy visit. He said everything looks great and he's happy to hear we are attempting a tube wean for her. He reminded me not to be discouraged if we have to go back to tube feeds. He said Allie is such a medical mystery that he feels it will take at least several tube weaning attempts (or more) before she decides to eat. At our previous ENT appointment in April, we did additional allergy testing and her RAST test came back positive for milk. Every other testing we did prior to this (skin prick and patch testing) milk came back negative. So, we didn't really know if she was allergic to milk or not. Allie's doctor has suggested we don't limit her food intake at all. Let her eat anything she wants and see if any signs of allergies pop up. So, in April we took his advice and since then, Allie has had absolutely no signs of food allergies. In addition, we gradually added gluten back into Allie's diet and she is not showing any signs or reactions to that either. So, her ENT doctor gave us the green light to continue what we are doing and allowing her to eat anything and everything she wants - no food limitations for allergies. This is a huge difference than back in January 2011 when she was supposedly severely allergic to corn. 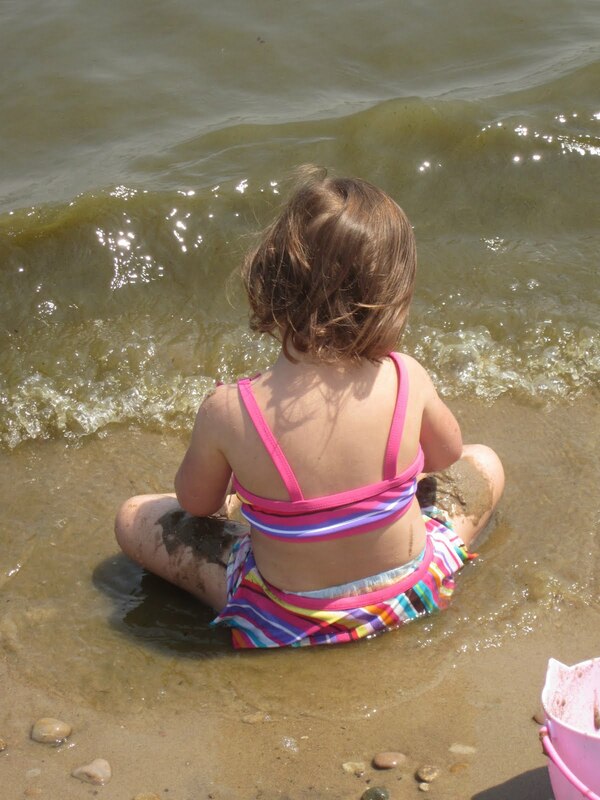 I have to say living with a child with food allergies is very difficult and the 3-4 months Allie was corn free was one of the hardest periods in my life. Everything we do is about food and having a child that could eat next to nothing was very hard (even though she didn't enjoy food anyway). Many people think that having a food allergy isn't a big deal but let me tell you it is. With Allie being gluten and corn free for several months, our world was turned sideways and we were continually struggling to find things a toddler could eat. My heart goes out to everyone with food allergies - it's not fun and the hardest part is other people often think having a food allergy is no big deal. So, hearing the words from Allie's ENT doctor today, "continue to not restrict any food in her diet" was like music to my ears. It was the best outcome we could have hoped for. At this time, we don't have a follow up appointment with her ENT doctor which is also wonderful. Her doctor does not feel the need to re-scope her at all since she is showing no signs of a allergy. I of course promised to watch her closely and if any symptoms pop up, I would give him a call right away. Like I said, it was a quick and easy appointment and we even received a huge ray of sunshine with good news. Now, if only Allie's tube weaning could go smoothly like that - lol. It is day 29 of our tube wean. Allie had a weight check at her GI's office this morning and she was 26.4 pounds. She has lost 1 pound since we started the wean. Allie had feeding therapy today and I have to say, "it was the worst session to date". Allie started out eating a couple bites of a bolognie & cheese sandwich, however she quickly made her mind up that she wasn't going to eat. I tried everything to get her to take a bite and she simply wouldn't. We tried bribing her with new toys, etc. we tried everything. So, I had to leave the room and let the therapist try to get her to eat. I sat outside the door on a little bench and listened to Allie screaming. We had 25 minutes left in our session and I heard one of the therapist tell Allie, "Allie, you have to take 5 bites or we will be here for 25 minutes. If you take 5 bites, we will go get mommy". I remember thinking there is no way I can listen to her scream for 25 more minutes. I knew they weren't hurting her in anyway, but just knowing that I could provide comfort for her yet I wasn't allowed was killing me. 10 minutes went bye and Allie is continuing to scream. I had all I could do to hold myself back and tell them it's over - we were going home. This wasn't the first time I have sat and watched (or listened) to therapist or doctors try to feed Allie - we had a week of this back in October 2009. It was awful and I remember the days like they were yesterday. Allie never did take a bite today for the therapist. She screamed for 25 minutes straight except when she needed to catch her breath. I sat there the whole time and listened to her. While I sat there with tears rolling down my face, I couldn't help but think of our upcoming appointment at the Children's Hospital of Wisconsin in September. 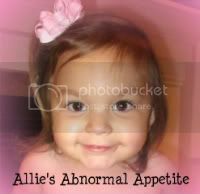 We are planning to have Allie evaluated to see if she is a candidate for the feeding program/intervention. Their feeding program/intervention is a 2 week inpatient program and from my understanding, it can be very brutal on the kids (and parents). While listening to Allie scream today, I'm now second guessing the CHW feeding program - is that really the right program for my little Allie??? There is no clear and simple answer to that question and Matt and I will have to try and figure it out. 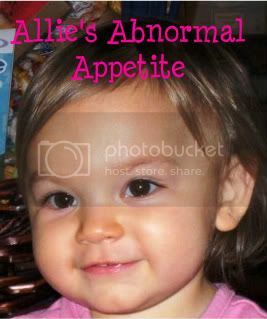 I guess after hearing Allie screaming today with her therapist, I question whether bribing begging, convincing, forcing and pleading with Allie to eat is even worth it. If she hates eating that much, why don't we just tube feed her? So many new questions popped into my mind today and I'm really struggling with sorting through them all. I have to remember there is absolutely nothing wrong with tube feeding Allie - it keeps her healthy. I know my long term goal is to get her off the tube but who knows where this long road will lead us. I'm not making any decisions this minute but I have a lot of thinking to do. A lot of things to sort out and try to figure what out what is best for our little Allie Rae. 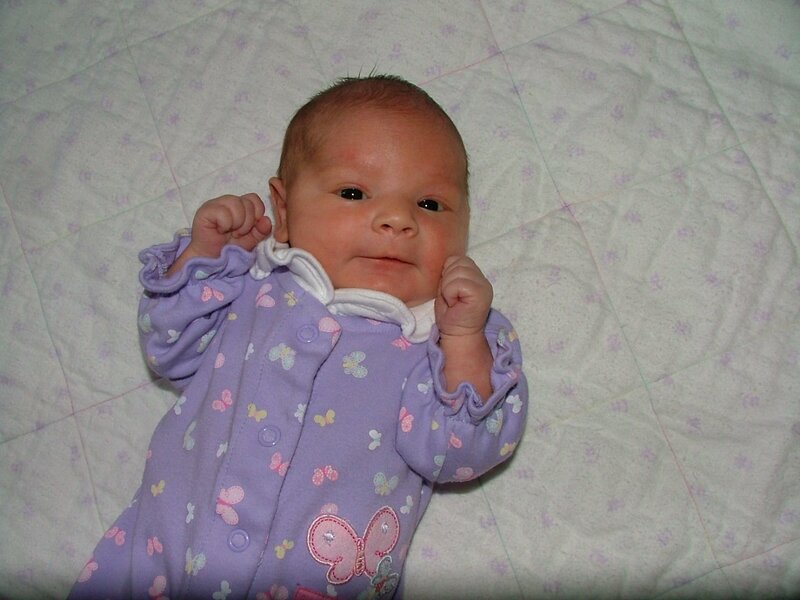 Allie at 1 month old - little peanut! 28 days of bribing, rationalizing, pleading, crying, requesting, and down right begging Allie to eat. Emotionally I am drained and ready to quit. This tube wean is brutal and I know how I feel and I can only imagine it's worse for Allie. 28 days of no tube feedings and Allie STILL doesn't want to eat. She is eating here and there. It seems to go in spurts with no rhyme or reason. Since we are now only allowing her milk at the table, her milk (E028 Splash) has decreased dramatically. She used to consume 12-16 oz a day orally and now she is consuming less than 8 oz of her milk. Allie will almost always eat Go-gurts, applesauce or pudding but she cannot live on those items, they are not nutritionally complete for her. We continue to struggle with getting her to the table to even see the food. For example, this morning she wouldn't even come to the table for breakfast. I asked her 6 times to come and eat and she kept saying, "I don't want to eat". I told her there will be nothing to eat or drink until 10:00 which is snack time and she said, "okay". So, Allie hasn't eaten or drinken anything since 8:30 last night and she doesn't wake up hungry or thirsty AT ALL. Allie goes in for a weight check tomorrow and I'm anxious to see how it goes. I have been weighing her at home and she is down a little. I'm still surprised that Allie's weight hasn't dropped more because her calorie intake is very minimal. I have noticed that Allie's energy level doesn't seem to be affected by her calorie intake. 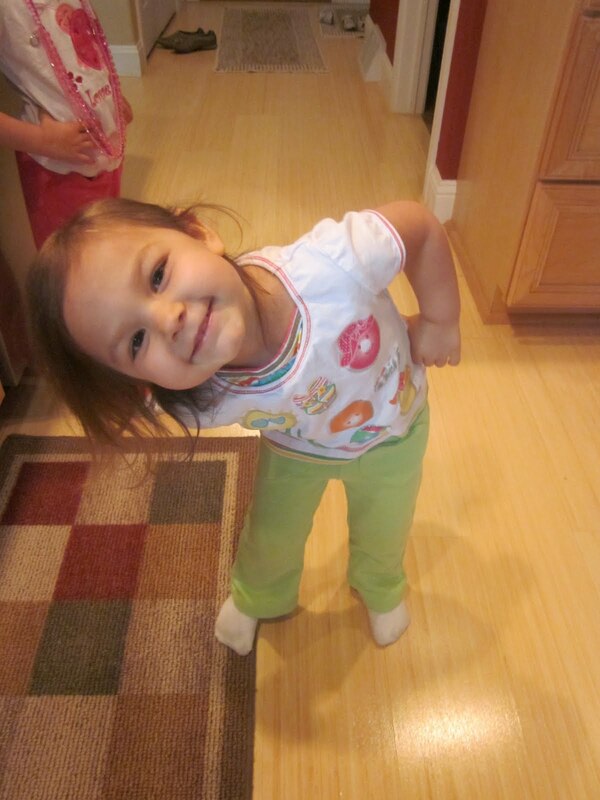 She is just on the go continually even though she isn't eating much at all. Seems as if Allie doesn't need food and liquid to keep going She's like the energizer bunny and just keeps going and going and going! So 28 days has flown bye yet the individual days seems to stand still. Convincing Allie to eat has been much harder than I ever imagined. However, she is eating a little and for that I am very thankful. I know this tube wean is not easy on Allie and quite honestly I think she is tired of it. Seems as time goes bye, she wants to eat less and less. Tired or not, we will not give up. I am determined to help Allie eat and a little frustration and exhaustion will not make me stop. God has chosen me to be Allie's mom because he knew I would do what is best for her and I will not let him down. So, little Allie, we will chug along and continue with this wean until it is unsafe for you. The minute you lose too much weight or anything else becomes a concern, we will start your tube feedings immediately. So, for now we continue to tread water and hope to stay afloat. The plus side, Allie is eating a little and there is no doubt she enjoys her snacks!!! 2) Allie will not eat a meal with us - she's only consuming snack throughout the day. Of course I have never attempted to wean Allie from the tube before so I feel like I jumped into an ocean by myself and I'm barely staying afloat. Allie's doctors are not really helping me - they are just monitoring her progress. Allie's doctors are scattered and as many of you know, getting doctors together to talk about your child's care is almost next to impossible unless they are all in the same building. 1) Allie is consuming most of her calories via liquid (E028 Splash) and she is currently having her sippy cup throughout the house all day. We don't limit when she gets her cup. 2) Allie is refusing to eat all meals at the table but continually ask for snacks. (yogurt, pudding & applesauce). I have been allowing her to have snacks since I'm trying everything in my power to get her to eat orally. Should I continue letting her have snacks or should I not? I of course want to wean Allie off the tube, however I also want her to learn good eating habits. "1) liquids ONLY with meals and only AFTER she eats (or attempts) to eat a meal. It will take time and patience to get thru this. Don't overwhelm her with a lot of food at one time as it may turn her off. You have the tube to make up the extra liquids that she may not drink b/c you're working on her behavior; but she needs to learn some new and healthier habits. 2) meal structure; structure is important so I'd recommend you offer her the usual meals and then only snacks in between meals and try and leave at least 2 hours between the snack to next meal if possible and no fluids in between. Goal is allow her stomach time to empty and stimulate hunger." This is what I thought she would recommend and in the back of my mind, I know it's the right thing to do. I have been pondering these issues for several days and yesterday I actually went with my gut and only allowed Allie do drink her milk at the table during mealtime or actually anytime she wanted a drink (which was never). To sum up how yesterday went, Allie consumed next to nothing. She barely consumed any milk and she ate 1/4 of a egg salad sandwich, 5 bites of pizza and part of an ice cream cone. She didn't get near her 1000 calories a day. With these new changes, I'm anticipating her calorie intake is going to drop significantly but I'm hoping she proves me wrong. So, in a way, I feel like I'm starting this weaning adventure all over again. These two changes (her milk at the table only & limited snacks) is huge for her. My motherly instinct is still continually telling me that Allie doesn't feel "hunger". She barely ate anything yesterday and yet this morning she wouldn't even take 1 bite or 1 drink of milk. After witnessing her eating habits for the past 3 years, everyday I'm still AMAZED at how our little girl just isn't interested in food. Sure wish we could figure out why! Hard to believe we are already on day 19 of Allie's first tube weaning attempt. In a way the time is flying bye, yet it also feels like it's never going to end. The constant effort it takes to get her to eat is simply draining. One thing I have learned so far (which I already knew) is that if Allie doesn't want to eat, you cannot get her to eat. I am a strong believer that Allie still doesn't feel the "hunger sensation". There is still a possibility that she feels it but doesn't understand what it is. Since we kept her full on tube feedings for over a year, she might just not understand what the feeling of hunger is. Allie ate next to nothing over the 4th of July and she was on a streak of that again for the past 3 days. Since Friday, Allie hasn't eaten much except a bite or two of solids. She has been drinking some of her special milk though - so that's a plus. Last week our feeding therapist was slightly bummed because Allie wasn't hungry at therapy and it was a struggle to get her eat. The therapist said that there is no doubt that with Allie being off tube feedings for this long, that she should feel hungry by now. So, we are chugging along and staying above water. Allie is still doing great on her weight, even though she's not eating much. Not sure how she is maintaining her weight but she is. We go back for another weight check next week sometime. I continue to struggle with Allie and trying to get her to eat. I have learned that she is in control of what she puts in her mouth and if she decides to not eat, there is nothing I can do at this point to convince her to eat. If she doesn't want to eat, she will still ask for a tube feeding. I try telling her that we are done with tube feedings and now she has to eat by her mouth. She doesn't care, she still refuses. But obviously, if she is maintaining her weight, she is drinking enough calories for her little body. Overall she continues to do great and we are very proud of her. Allie is one tough little girl! Please add our friend Shannon and her family to your prayers. She lost her husband unexpectedly and she has 3 young girls at home. Thank you. Allie had a weight check this morning and she weighed in at 27 pounds. She was down only 0.4 pounds. Allie continues to drink her Eo28 Splash continually. Most of her oral calories are coming from that. She is doing really good but I'm still concerned that most of her calories are coming from liquids. I know that might change with time so I'm not stressing about it yet. I'm very happy with her current weight but quite honestly, I thought she was going to lose more than she did. It felt like she didn't eat anything over the 4th of July weekend. She must have consumed more than I thought so that's great. Allie is doing amazing with this tube weaning. I'm so proud of her, she is working really hard at eating. It's of course still a struggle to get enough food into her but she's doing great. She is starting to pocket food a bit more than before and she is also starting to chew her food then spit it out. We will work past these little bumps in the road and if it takes a while, that's alright, at least she's eating!!! Allie goes back for a weight check in 2 weeks. I'm very happy with her progress so we are going to continue holding all her tube feedings. We didn't meet with her GI doctor today but I'm assuming he would recommend the same thing. Allie's energy level has fluctuated slightly from day to day but I notice that on days she doesn't eat much, she is less active. I keep reminding her that she needs to eat in order to have energy. Honestly I don't think she understands it but I don't know for sure. So,things are going well and we will continue on this path. It has been almost 2 full weeks since Allie had a tube feeding - that's amazing!! !